Over the past 25 years, there has been a steady increase in the involvement of the private sector in the global education landscape. 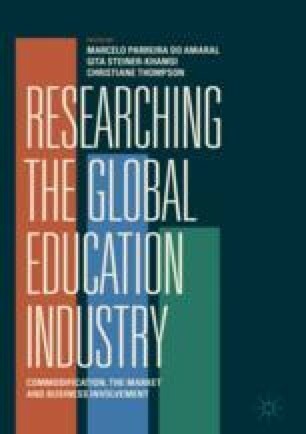 While studies of what is now referred to as the global education industry have taken a critical look at some of these new private sector actors, there has been less attention paid to the role of the United Nations Educational, Scientific, and Cultural Organization (UNESCO) in facilitating their entry and growing influence. This chapter explores the relationship between UNESCO and various private sector organizations active in the global education market. It examines how a multilateral donor organization which, in its own words, is committed to education for all is increasingly appearing as a brand for sale, with its commitment to free, universal education being seemingly diluted over time. It also examines some of the more recent private sector partnerships and trends in private sector funding for UNESCO, alongside exploring the ethical conflicts inherent in some of these relationships. The chapter concludes by considering how the increased involvement and solicitation of funds from the private sector may actually be influencing and driving UNESCO’s global education agenda rather than the other way around, thus potentially placing UNESCO’s own brand and reputation at risk. Draxler, A. (2008). New Partnerships for EFA: Building on Experience. Retrieved from www.unesco.org/iiep/PDF/pubs/Partnerships_EFA.pdf. Accessed 03/01/2018. Draxler, A. (2014). International Investment in Education for Development: Public Good or Economic Tool? International Development Policy | Revue internationale de politique de développement. doi: https://doi.org/10.4000/poldev.1772. Education UNcovered. (2011, November 11). UNESCO Funding Cuts – Highlighting Internal Inefficiencies. Retrieved from https://eduncovered.wordpress.com/2011/11/11/unesco-funding-cuts-highlighting-internal-inefficiencies/. Accessed on 03/01/2018. Engel, L. C., & Rutkowski, D. (2012). UNESCO Without U.S. Funding? Implications for Education Worldwide. Retrieved from webcache.googleusercontent.com/search?q=cache; http://ceep.indiana.edu/pdf/SP_UNESCO.pdf. Accessed 03 Jan 2018. Ericson. (2014, March 31). Ericsson Named a Network Supplier and Managed Services Provider for Telenor in Myanmar. Retrieved from https://www.ericsson.com/news/1772778. Accessed on 03/01/2018. Haddad, W., Colletta, N., Fisher, N. Lakin, M., & Rinaldi, R. (1990). World Conference on Education for All: Meeting Basic Learning Needs. Retrieved from http://unesdoc.unesco.org/images/0009/000975/097552e.pdf. Accessed on 03/01/2018. Harvard School of Public Health. (2017). Sugary Drinks and Obesity Fact Sheet. Retrieved from https://www.hsph.harvard.edu/nutritionsource/sugary-drinks-fact-sheet/. Accessed on 06/20/2017. Mezzalama, F., & Ouedraogo, L. (1999). Private Sector Involvement and Cooperation with the United Nations System. Retrieved from unesdoc.unesco.org/images/0012/001203/120349E.pdf. Accessed on 03/01/2018. OECD. (2015). Students, Computers and Learning: Making the Connection, PISA. OECD Publishing. Retrieved from https://doi.org/10.1787/9789264239555-en. Accessed on 03/01/2018. PepsiCo. (2014, March 28). Pepsi-Cola Bottling Plant Opens in Myanmar. Retrieved from www.pepsico.com/live/pressrelease/pepsi-cola-bottling-plant-opens-in-myanmar03282014. Accessed on 03/01/2018. Pogge, T., & Sengupta, M. (Forthcoming). Critique of the Sustainable Development Goals’ Potential to Realize the Human Rights of All: Why Being Better Than the MDGs is Not Good Enough. Journal of International and Comparative Social Policy. Retrieved from https://cpb-us-w2.wpmucdn.com/campuspress.yale.edu/dist/6/1129/files/2015/10/SDG-HR_Rev-Jan-25-uugh97.pdf. Accessed on 03/01/2018. UN. (2017a, June 28). Increased Support for Education Crucial to Reaching Sustainable Development Goals, Speakers Tell High-level General Assembly Event. Retrieved from https://www.un.org/press/en/2017/ga11925.doc.htm. Accessed on 03/01/2018. UN. (2017b). World Day Against Child Labour 12 June. Retrieved from www.un.org/en/events/childlabourday/resources.shtml. Accessed on 09/19/2017. UN General Assembly. (2000). Comments by the Administrative Committee on Coordination on the Report of the Joint Inspection Unit entitled “Private Sector Involvement and Cooperation with the United Nations System.” Retrieved from unesdoc.unesco.org/images/0012/001203/120349E.pdf. Accessed on 03/01/2018. UNESCO. (1999a). Communities. Retrieved from portal.unesco.org/en/files/12695/10545478091unc36e.pdf/unc36e.pdfportal.unesco.org/en/ev.php-URL_ID=12695&URL_DO=DO_TOPIC&URL_SECTION=201.html. Accessed on 03/01/2018. UNESCO. (2011, December 13). Irina Bokova: Technology Can Be a Powerful Education Multiplier. Retrieved from www.unesco.org/new/en/unesco/about-us/who-we-are/director-general/singleview-dg/news/irina_bokova_technology_can_be_a_powerful_education_multipl/. Accessed on 03/01/2018. UNESCO. (2012a, April 26). Education Entrepreneur Sunny Varkey to be Named UNESCO Goodwill Ambassador. Retrieved from http://www.unesco.org/new/en/media-services/single-view/news/education_entrepreneur_sunny_varkey_to_be_named_unesco_goodw/. Accessed on 11/22/2018. UNESCO. (2012b). Follow-up to the Independent External Evaluation of UNESCO: Work for Strategic Partnerships. Retrieved from unesdoc.unesco.org/images/0021/002175/217583e.pdf. Accessed on 03/01/2018. UNESCO. (2012d). UNESCO Global Partnership for Girls’ and Women’s Education – One Year on. Retrieved from www.unesco.org/eri/cp/factsheets_ed/ke_EDFactSheet.pdf. Accessed on 03/01/2018. UNESCO. (2013). A Practical Guide to UNESCO’s Extrabudgetary Activities. Retrieved from unesdoc.unesco.org/images/0022/002201/220157e.pdf. Accessed on 03/01/2018. UNESCO. (2014). UNESCO Education Strategy 2014–2021. Retrieved from unesdoc.unesco.org/images/0023/002312/231288e.pdf. Accessed on 03/01/2018. UNESCO. (2016). UNESCO Transparency Portal. Retrieved on December 20, 2016 from https://opendata.unesco.org/projects/list/regions. Accessed on 03/01/2018. UNESCO. (2017a). Education: Mission. Retrieved from www.unesco.org/new/en/education/themes/leading-the-international-agenda/education-for-all/mission/. Accessed on 01/25/2017. UNESCO. (2017b, March 17). Director-General to Attend Global Education & Skills Forum in Dubai. Retrieved from www.unesco.org/new/en/unesco/about-us/who-we-are/director-general/singleview-dg/news/director_general_to_attend_global_education_skills_forum_i/. Accessed on 06/22/2017. UNESCO. (2017c). Private Sector. Retrieved from en.unesco.org/themes/private-sector. Accessed on 01/22/2017. UNESCO, & Microsoft. (2004). Cooperation Agreement. Retrieved from www.unesco.org/fileadmin/MULTIMEDIA/HQ/CI/CI/pdf/strategy_microsoft_agreement.pdf. Accessed on 03/01/2018. UNESCO Bangkok. (2015). UNESCO Partners with Ericsson to Launch an ICT for Education Project in Myanmar. Retrieved from www.unescobkk.org/news/article/unesco-partners-with-ericsson-to-launch-an-ict-for-education-project-in-myanmar. Accessed on 03/01/2018. UNESCO Constitution. (1945). Constitution of the United Nations Educational, Scientific and Cultural Organization. Retrieved from https://www.gov.uk/government/uploads/system/uploads/attachment_data/file/269685/UNESCO.pdf. Accessed on 03/01/2018. Varkey Foundation. (2016a). About Us. Retrieved from https://www.varkeyfoundation.org/about. Accessed on 12/27/2016. Varkey Foundation. (2016b). Changing Lives Through Education. Retrieved from https://www.varkeyfoundation.org/homepage. Accessed on 12/27/2016. WHO. (2017, April 13). Radical Increase in Water and Sanitation Investment Required to Meet Development Targets. Retrieved from www.who.int/mediacentre/news/releases/2017/water-sanitation-investment/en/. Accessed on 03/01/2018. World Economic Forum. (2011). Global Education Initiative Retrospective on Partnerships for Education Development 2003–2011. Retrieved from www3.weforum.org/docs/WEF_GEI_PartnershipsEducationDevelopment_Report_2012.pdf. Accessed on 03/01/2018.